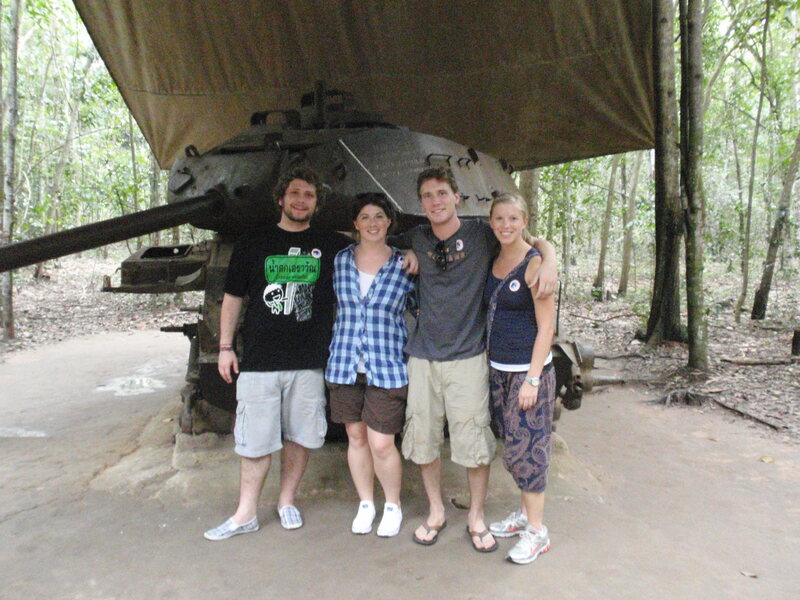 Sean and I, along with our two good friends Ali and William, spent the last two weeks traveling throughout Vietnam. We spent 5 days in Ho Chi Minh City and 5 days on Cat Ba Island, one of the islands in Halong Bay. After a few months of relaxing around Bangkae and a semester of teaching for everyone else, we were all ready to get out of Bangkok and enter the world of backpacking. Ho Chi Minh City (or more popularly known by locals as Saigon) is a bustling city, much like Bangkok, but with more of a western influence. As this was our vacation, we splurged on some amazing western meals. We quickly found that the wine was relatively cheap compared to Thailand and therefore a bottle of Da’ Lat wine became a staple for almost all of our dinners. We spent our time in Ho Chi Minh bargaining at the markets and street shops alike, traveled 40 km outside the city to the Cu Chi Tunnels, experienced a very bizarre Cao Dai religious ceremony, and had a much needed Vietnamese massage. The second and final leg of our trip was the highlight of our travels. After a long day of traveling from Hanoi to Cat Ba Island, we were met on the opposite side of the island by a group of motorbike drivers offering to take us to Cat Ba Town (30 km away). Even though it was a bit of a rip off, we each got on the back of a motorbike and began the beautiful journey along the coast of Cat Ba Island. Sean and I were still toying with the idea of heading back to Hanoi early to explore the city. After this ride, we made the decision to stay on Cat Ba as long as possible. 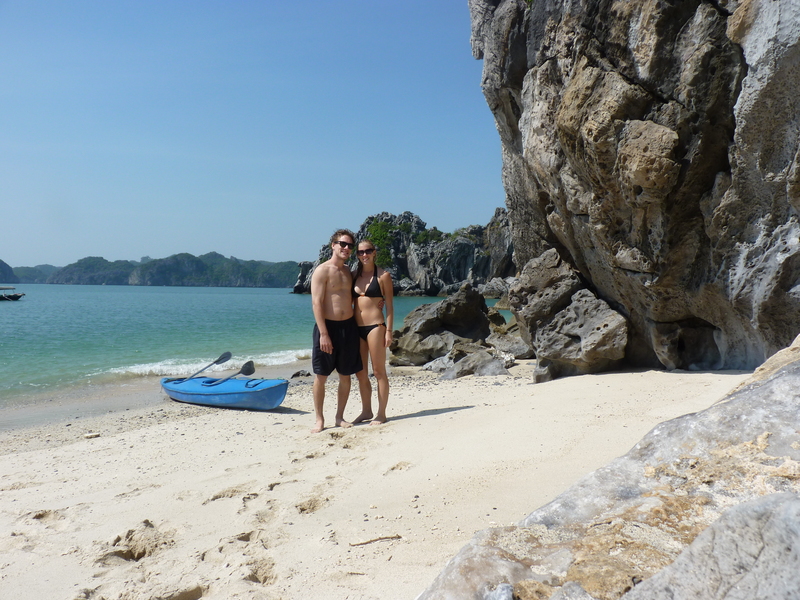 Our first two days on Cat Ba Island, we rented mountain bikes and motorbikes. 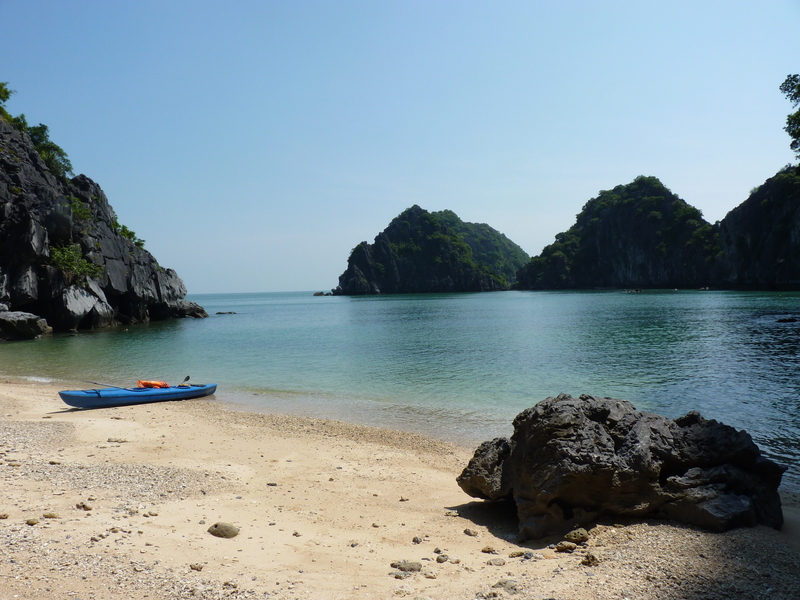 Both were great ways to explore the curvy coastal roads of this island (for more, see Sean’s blog post: Camp Cat Ba). The third day on Cat Ba we rented Kayaks. Instead of opting for a tour, Sean and I chose to rent through a company that dropped you off at a harbor, with one kayak, and the only instructions being “go left. And come back before sunset”. After only a few minutes of kayaking, we were out of the harbor and in the heart of a floating fishing village. The landscape was like nothing I have ever seen before. Emerging from the glassy water were enormous rock mountains. We spent the morning and most of the afternoon exploring different mountains, especially the ones with deserted beaches, and treating ourselves to a dip in the clear blue water of Halong Bay. The only thing that could have made this perfect day even better was a picnic, as the grueling sun and our rumbling stomachs forced us to head in mid-afternoon. We left Vietnam a few days later. I was ready to get back to Thailand. Traveling is such a whirlwind of excitement, but the thought of “going home” to place where you know some of the language and are not treated as a tourist is very comforting.